Hello friends! The reviews I write are brutally honest. Since 2004, I've been designing graphics and editing images, and I have over 12 years of experience developing websites and online games. I'm also a huge tech dork. The nice people at FotoJet reached out again, and again it took me forever to complete my review of their newer product, the FotoJet Collage Maker as a Mac OS App. (My apologies, FotoJet!) This Mac app costs $4.99 (USD) and Phil and Mama received a free copy to review. We also have a copy (redeemable code in the Mac App Store) to give away! FotoJet is "an all-in-one free online tool for photo editing, graphic design and creating photo collages. It's a web app and now it's a Mac OS X App, a photo grid and image collage maker that you can use on your Mac laptop or computer. The cost for the web app is not bad, but considering that there are free options out there, such as FotoJet's web app and the web app I always go back to, Canva, people may not fork out the $4.99 for a Mac OS X app. You buy the app from the App Store, install it and then it runs quickly. The main screen is simple, complete with template layout and options. The look is crisp and clean. 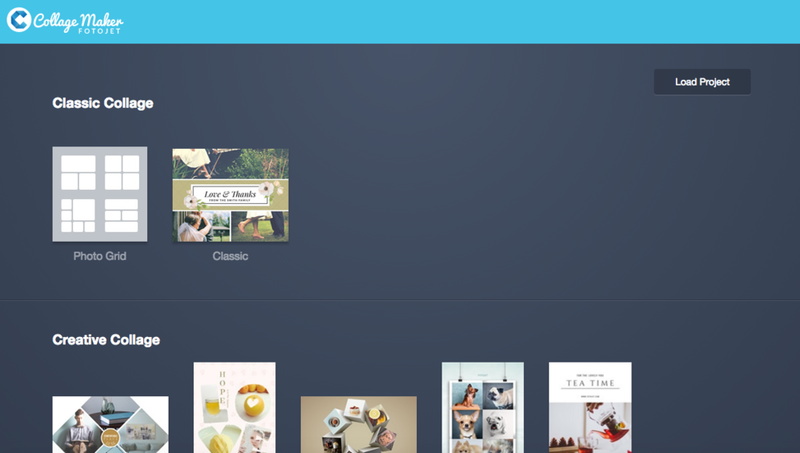 There aren't too many layouts and templates to choose from, and I personally prefer that because I like to create my own printables, collages, and projects from scratch. DIY, baby! I noticed that this version of FotoJet does not come with the powerful photo editing tools the web app version has. (Or maybe I have not dug deep enough yet?) There aren't any photo filters, or effects, other than opacity. What I do like is that you can import photos from your Facebook account, granted you link your account to the app, and that you can search for thousands of photographs to use over the web. I believe these images are royalty-free since they don't have watermarks, and don't come with usage warnings. You can, of course, upload your own images and photographs to use. It doesn't take long for one to familiarize herself with the user interface. There aren't many buttons to press, just five on the left side: Template, Photo, Text, Clipart, and Background. With the templates, you only have a few to choose from for each category of templates. You have more than a dozen of text arts and plenty of fonts at your disposal. The background selection is limited, and I couldn't upload my own background to use in the background tab. You're able to save your project, share it using social media, and export it as a PNG or JPG. The clip art gallery is generous, filled with pretty vector art. Plus, you can comb the web for thousands of other clip art, using the search function. I searched for pandas and found plenty of panda clip art to use. Hopefully, they are all royalty free! This I like a lot about FotoJet's Mac app. Here's a monthly milestone printable that I quickly created using the Mac app. I look forward to creating more projects using this app. Check out my screen capture of me playing around with the FotoJet Mac OS X app. I have a fun new tool at my disposal. I imagine I can make a lot more printables, post cards, posters, flyers, stickers, and collages with FotoJet's Mac app. I feel that it could still use a bit of touching up, and I'm hoping that the updates in the future come with additional layouts and templates to use, along with a photo editing tool (for filters and effects). I wish there was a blank template I could use, especially one where I can choose the size. Also, when you save your project, you can only save it as a PNG or JPG. It would also be great if the user could also save the project as a PDF. Despite my nitpicking, for what FotoJet wants to achieve, it's already there. Thanks for reaching out again, FotoJet! To enter to win a free copy of the FotoJet Mac OS X app, please leave a comment below. Thank you and good luck!